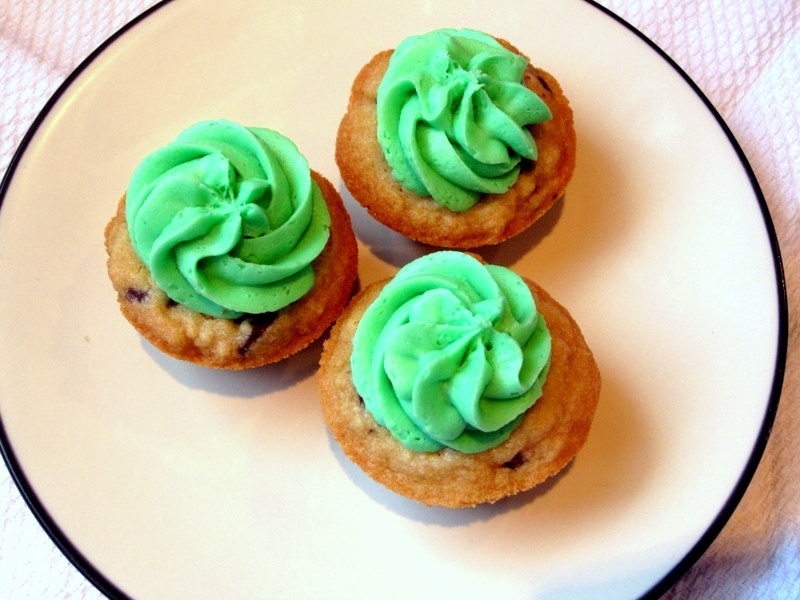 Chocolate Chip Cookie Cups with Frosting – almond buttercream, to be exact. Check out the recipe below! Of COURSE I had to go green…gotta represent my Jets!! These are so simple to make, yet so amazingly delicious! 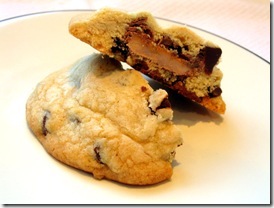 It’s just a basic chocolate chip cookie recipe, cooked inside a mini muffin tin. Then you hollow out the centers just a bit before cooking to make room for the frosting. 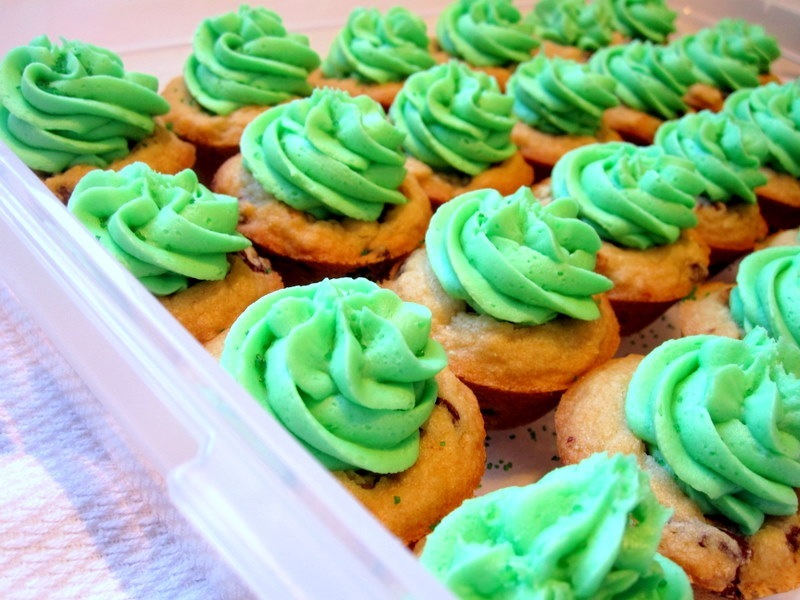 Mmmmm…nothing beats homemade frosting, am I right?? Instead of making a regular vanilla buttercream, I did my favorite switch-a-roo and substituted to make almond buttercream. If you’ve never tried it, please do. It will change your life. Soft and chewy chocolate chip cookies are filled with a decadent almond buttercream frosting. Two bites, and you're in heaven! Preheat oven to 350 degrees. Mix together butter and sugars with electric mixer on medium speed until pale and fluffy, about 2 minutes. Reduce speed to low. Add salt, vanilla, and eggs; mix until well blended, about 1 minute. Mix in flour and baking soda. Stir in chocolate chips. Transfer cookies to wire racks. Let cool completely, then fill with frosting, using a pastry bag or sandwich bag with the corner tip cut off. Cream together butter and sugar. Add almond extract and 1 tbsp. milk. Continue to add milk until your desired consistency is achieved. They’re candy-bar-filled chocolate chip cookies! 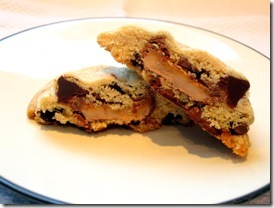 Specifically, Milky-Way filled chocolate chip cookies. After seeing the idea over on Picky Palate’s site, I became a little obsessed. 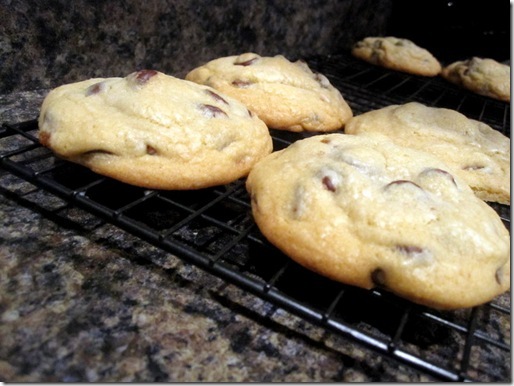 It’s a good thing I only made 8 of these cookies…since there’s only 2 left! It’s almost GAME TIME…we’ll be heading out shortly to go back over to my parents’ house for the big Jets Game. Hopefully it’s as good as last week!!! Looks amazing!! 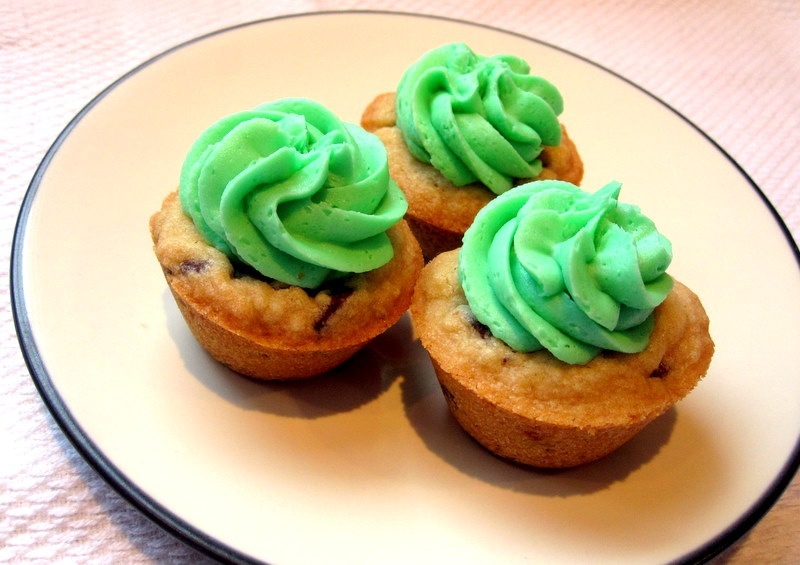 I need a good cupcake recipe for my daughters bday this weekend, I may give these a try! Those cookies look awesome!! I have Brooks stability sneakers, and I really like them. If you haven't been... try Fleet Feet on Wolf. I was fitted for and bought my Mizunos there... and if you don't like them, I think you can bring them back and try a different pair. They do that whole watch you while you run thing to help you get fitted for your shoes. 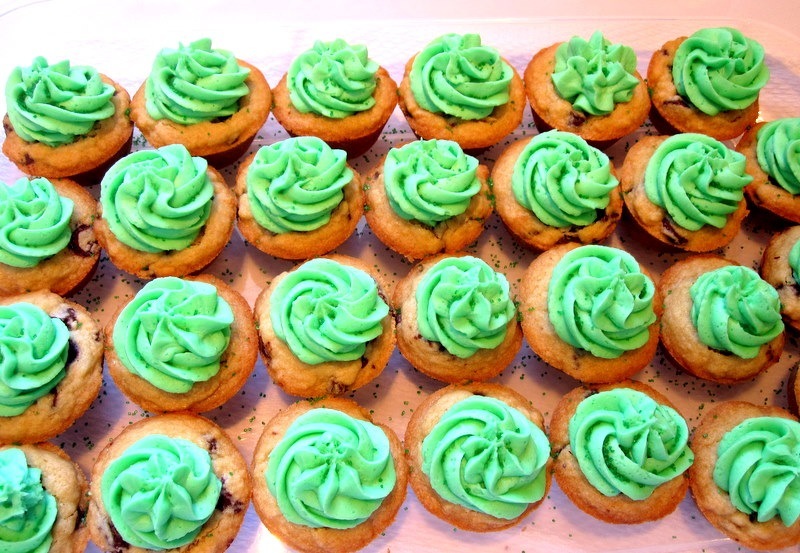 Ugh, colored frosting gets me every time. They look so delicious!! Enjoy 'em and I hope your Jets win! 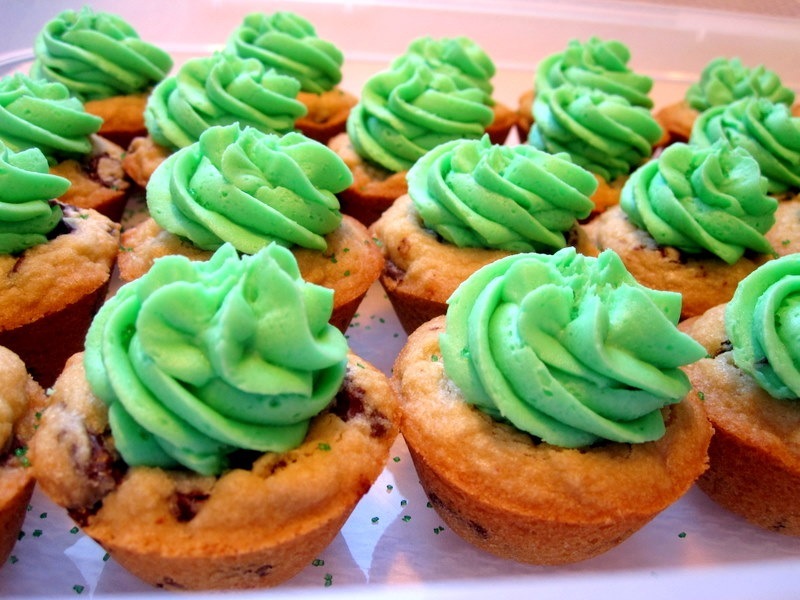 Those cookie cups look delicious! I think I will need to try those soon. yeah! dessert i love it!!!!!!!! I love my Asics Foundations...but I'm severe over pronator. I had to get wide width this time because they changed the model and they were narrow and hurt my feet. Looking forward to seeing your Jets against the Packers!! Yay! So glad the Packers game is over and I know for sure they are going to the Superbowl! You have just sent my sweet tooth out of control! Awesome job on your choc chip cupcakes! 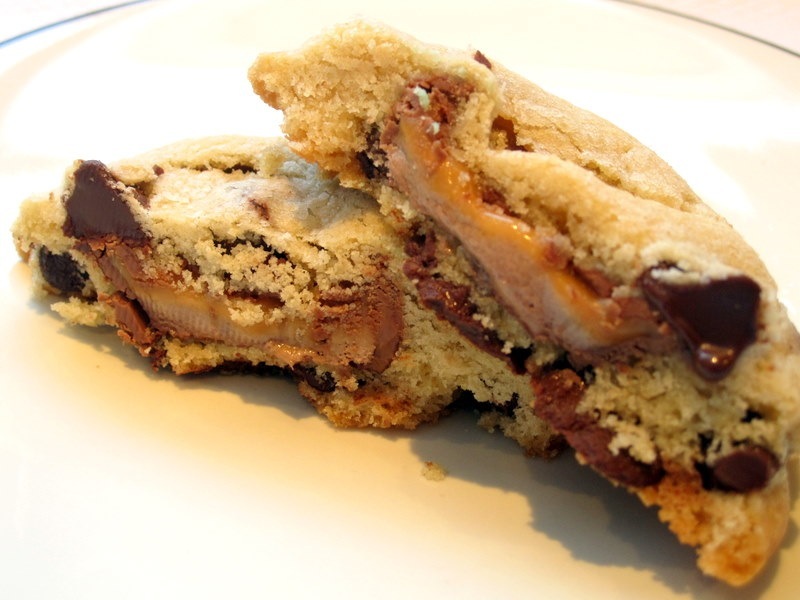 And those candy bar cookies... oh my! 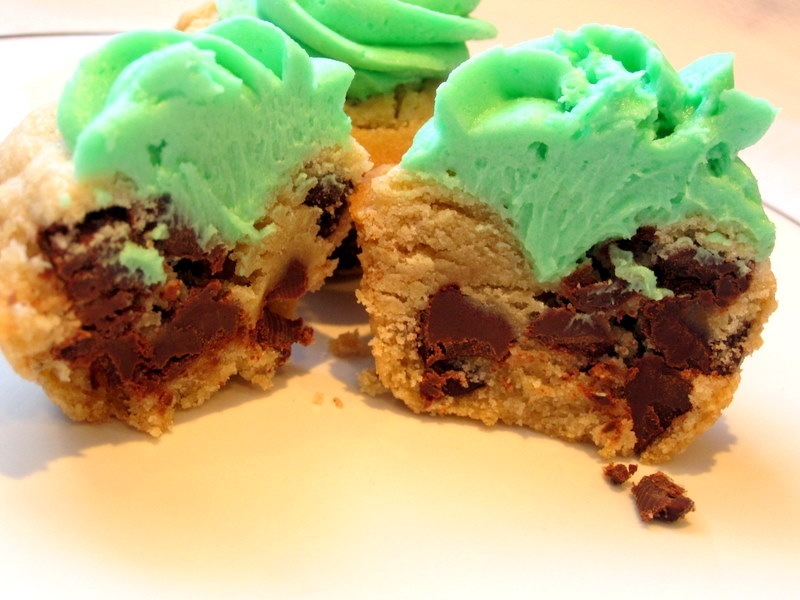 I am seriously drooling over those cookie cups!!!!! These definitely solve my problem of not liking a thin chocolate chip cookie - put it in a muffin cup - genius! I think I have to make those little babies! Now I want cookies! And it is your fault :P.
Wow oh wow!!! Those cookies looks amazing!!!!! Wow - those cookie cups look incredible! I'm definitely trying them this week :) I love running shoes - just picked up a new pair at Nordstrom Rack myself! 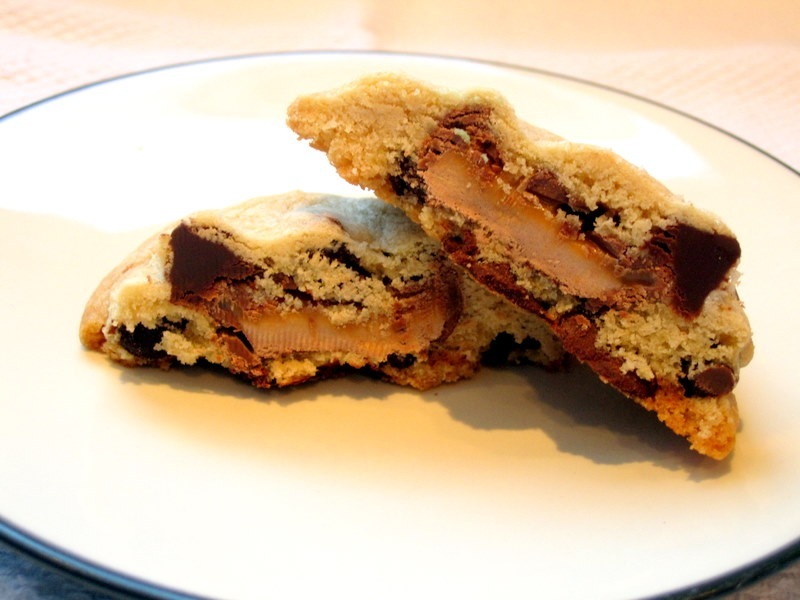 Candy bars wrapped in chocolate chip cookies is a life necessity. Those cupcakes look amazing! I was an asics girl until I tried Mizunos. They are so comfortable... and hot pink. I highly recommend. OMGOMGOMGOMGOMGOMOGMGOGMOGMGOGMOGMOGMGOMGOGOGMGLIKE LEGIT.. that looks SO FREAKING GOOD WITH THAT FROSTING!! i WANT TO TAKE ONE OFF THE SCREEEN!! Yum! These sweet treats look amazing!!! Those candy bar filled cookies look AMAZING! Those are absolutely on my to-make list for the week! Asics -Gel Cumulus 12 are my current running shoes and I love them! ahhh almond buttercream sounds AAMMZZIINNGGG i cant believe i never thought to do that! 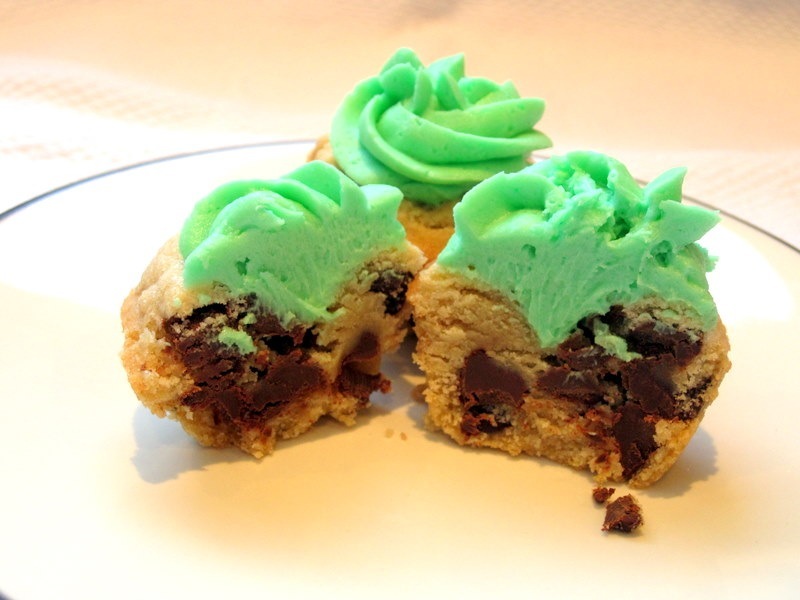 And those cookie cups AND the candy bar cookies.. i need to bake cookies NOW! Oh yum! What a great idea to use almond frosting on chocolate chip cookies. I love how you used mini muffin pans too! Chocolate chip cookies are my favorite! I'm visiting from SFAS. I wish I could run 5 miles...maybe some day! Oh my gosh, these all look sensational! It's almost midnight and I'm getting hungry again just looking at these. Thanks for linking this up to Sweets for a Saturday. These look absolutely incredible! I LOVE them. 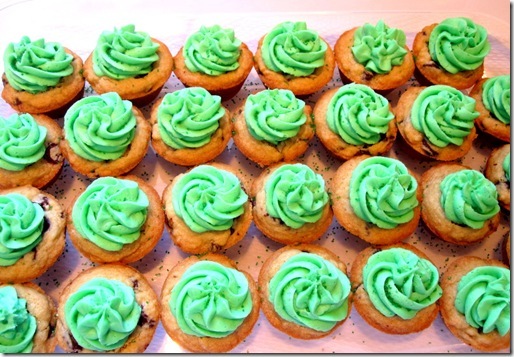 Super fun with the green frosting too! I love my Mizuno Wave Riders - had 2 pair now. And I foudn this by searching for buttercream filled cookie cups! I am going to make these for a friends bake sale to raise money for her Susan G. Komen 3 day 60 mile breast cancer walk! Pink frosting, individually boxed with red/white bakers twine! They look perfect! Thank you! Oh gosh...I *think* you'll get about 48, but I don't have my original recipe here with me. I'm sorry!